From left to right: Film Program, Set box, 16mm film cel, Dvd chapter listing booklet. 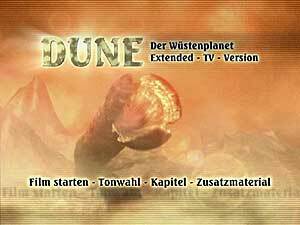 On July 1, 2003, Marketing Films in Germany released the latest of their many Dune dvds, this one dubbed the "Perfect Collection." 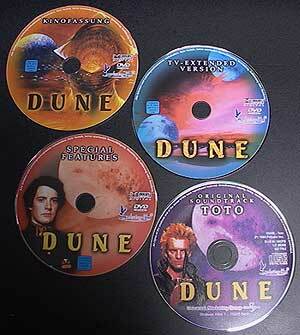 The Perfect Collection is a four disc set (three dvd, one cd) aimed at the serious die-hard Dune fans. The set comes packaged in a blue velvet book-like case with the individual discs in metal tins (two discs in each tin). The tins don't really hold the discs in very well, but thankfully there's nothing in the them that can really scratch the discs if they get free. So, is this really the perfect collection you ask? Well, no, not really, especially when you consider what you get for the high price tag attached. The quality of the extras for this amount of money leaves a bit to be desired. But if the price was more than halved it wouldn't be too bad a set. Let's look at what you get. Both the theatrical (left) and TV (right) discs feature animated menus. 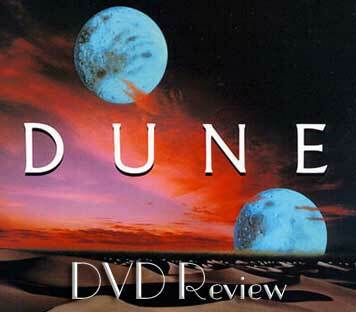 Finally the theatrical version of Dune gets a widescreen anamorphic dvd release. Gone is most of the nasty edge enhancement that plagued the LD transfer re-hash used on the US DVD release. 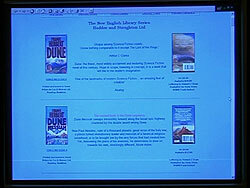 Dune is presented in it's original aspect ratio of 2.35:1, though there's a slight bit of the image cropped off the left side. Colors don't blur towards red like the US disc, though they are a bit dull and washed out. There are some slight specs of dirt and dust on the print here and there, but nothing major. There are some visible compression artifacts though, and the bit rate suffers a bit from having a long film with two 5.1 soundtracks (and two 2.0 ones) and extras all squeezed on the same disc. The extras on the theatrical disc really should have all been moved to the third extra disc to allow more bits for the film itself. The transfer is the best Dune has looked on DVD so far, but that's not saying much considering the poor quality of the other discs. There's definitely room for improvement. Let's hope Universal does a brand new transfer when they finally get around to doing the SE they've been wanted to do for years now (though at this rate by the time they get around to it we'll probably all be watching HD-DVDs). Now we get to the reason this set costs so much, the "extensive" extras (well, that and the packaging). However, before you run out and spend your $100 on this set, I'll point out that almost every extra on the DVD set is taken from the duneinfo.com and Museum Arrakeen websites. So you might want to save your cash and surf over to them for free to see all the extras for yourself. But back to the disc. 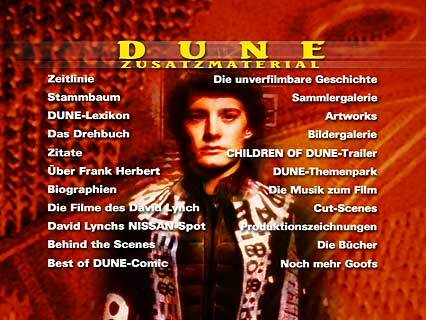 The first extra on the same disc as the theatrical cut of the film is the Making of Dune. Unfortunately for those non-German speaking folks, it's entirely in that language with no subtitles available in any other. I was able to get some of it translated though. From what I can tell, it appears to be mostly information taken from Ed Naha's "Making of Dune" book. In fact, most of the images appear to be taken from there as well. There are no new (or even old for that matter) interviews with anyone involved with the film. The documentary consists entirely of a narrator reciting information out of the Naha book, speaking over pictures of storyboards and images from the film. If you have the Naha Dune book, you pretty much already have this doc. The strange thing is that there already is a pretty good Making of Dune documentary that Universal created as promotional material for the film back when it came out. I've always wondered why it never makes it on to any DVDs as an extra. It's almost half an hour long and features interviews with most of the major players on the film (both cast and crew as well as Herbert), information about creating the effects and also some behind the scenes filming. Again, it'd make a natural DVD extra, but it's no where to be found on this "perfect collection." The next extra on the first disc is entitled "goofs." At first thought one might think this is outtakes from the film. No such luck. This consists of stills of minor mistakes and continuity errors found in the film, some of which are questionable at best. For instance, the one pictured here shows how the Duke talks into one side of the top of a microphone in one shot, but the other side of the top in another. Calling this a goof is a stretch since last time I checked you can talk into a microphone at any angle as long as you talk in the right end. Who's to say theirs don't work like ours on Earth do. Another goof they list is that when Sting walks out of his shower, you can (barely) see the tan lines of a watch on his arm. Apparently the Harkonnens don't need to tell time or never wear any wrist devices of any kind. Again, this like the other "goofs" is just silly nitpicking, and like most things in this section, don't really merit disc space. This is all fine for a website, but hardly worthy of a deluxe DVD collection. The next extras on disc one are still galleries of production photos and promotional material (posters, video releases, etc). Both of these extras are also on disc three, so there was really no reason to include them here as well. Lastly, there's a director and cast bio's section, which once again is duplicated on disc three. One can't help but wonder if they're going to release the first disc separately at sometime and didn't want to have to press or author a new disc for it. Disc two contains what can probably be considered the longest extra of all of them, the extended TV cut of Dune. Anyone who's seen this knows how awful it is, and why Lynch had his name taken off it. For those who haven't seen it, while there is new footage added (though some of the longer length comes from effects shots repeated several times), there's also an annoying narrator who explains everything that goes on in ridiculous detail. Each of the characters are introduced as they come on screen like some sort of bizarre game show. As with all copies of the TV version, the audio and video quality is fairly poor since leftover elements were used to create the new cut, which being for TV is of course in a 1.33:1 aspect ratio. If you've never seen the TV cut, it's worth a viewing once just to see some of the extra footage and to understand why Lynch wanted nothing to do with it. While many regard Dune as one of Lynch's lesser works, the TV cut makes it clear just how much worse the film can be out of his hands. The TV version disc also contains some extras. All of the footage added for the TV cut can be viewed separately, as can the original commercial break points. There's also a 9 minute featurette on dubbing the new German soundtrack for the TV version, naturally presented entirely in German. The third disc in the set is devoted entirely to extra features. First up is a text only timeline taken from the Museum Arrakeen website. It covers the entire history of Dune from the prequel books all the way though the many sequels. It's text only, in German. Also from the Museum Arrakeen website is a family tree of the Atreides line, starting a couple of generations back from Paul, following down through his children. Again, it is text only, in German, though of course the names are the same in any language. Next we have the Dune Encyclopedia, but don't confuse it with the long out of print book by Dr. Willis E. McNelly of the same name. This encyclopedia here is very short, giving brief details of characters, places, and objects from the film. I suspect it's taken from a website as well, but I haven't taken the time to surf around and find out which one. Like the other text only extras, this one is also presented only in German. It would have been nice if at least clicking on an entry would bring up a clip from the film or picture of the item in question, but no such luck. Moving on, we come to a section of text only extras again taken directly from the Museum Arrakeen website. This section includes notes on the script development, text interviews with Frank Herbert and Lynch, and an analysis of the script structure. All the text has been translated into German. Also included are various quotes about the film, this time not translated from English, but also from the Museum Arrakeen website (I hope the guy who runs that site made some good money off all this!). The final extra "ported" from the Museum Arrakeen site is a text section on Frank Herbert, including a bio, bibliography and quotes. All are in German except the quotes, which are in their original English. But wait, we're not finished with the text only extras yet. The next section repeats the director and cast bios already found on disc one. Bios included are David Lynch, Kyle MacLachlan, Francesca Annis, Jurgen Prochnow, Sting, Kenneth McMillian, Patrick Stewart, Sean Young, Dean Stockwell and Max von Sydow. It's exactly the same as disc one, no difference - no reason why it's on here twice except to make it look like you're getting more than you really are. Finally, we get some video extras. The section "Die Filme des David Lynch" contains trailers for all of Lynch's films except Eraserhead, and ironically, Dune. However, the trailers for Wild At Heart, Lost Highway, Straight Story and Mulholland Drive are German dubbed, the others are the original English. The Wild At Heart one sounds downright silly, as not only do the voices sound nothing like the original actors, but even non-language specific sounds were dubbed, such as Harry Dean Stanton's barking and Diane Ladd's growling. I'd hate to think what the whole film sounds like dubbed this way. At last we come to what is probably the best extra of the disc, David Lynch's Nissan Micra ad. Included are both the short TV version of the ad and the longer theatrical version. The picture quality of both ads is absolutely perfect, and it's nice to have a good, high quality copy of them. Too bad Lynch couldn't release an ads dvd, but I'm sure it'd be a rights nightmare to sort out. Along with the ads themselves is a short making of featurette, which is annoyingly dubbed in German, including the parts where Lynch himself is speaking in English. If you listen closely you can mostly make out what he's saying underneath the German translator though, but his parts really should have been subtitled instead of dubbed. Well, so much for the nice extras, now we're back to stuff taken from websites. First up is a behind the scenes photo gallery of pictures taken on the set during filming. Some of these are also in the previous production photos gallery, meaning they appear in the set three times. Some are new though. Included are pictures of the actors and crew during filming and also some of the original design photos for various sets and props (which appear again later in their own gallery). Many of these are from the previously mentioned Ed Naha "Making of Dune" book, with a few thrown in from the Museum Arrakeen and duneinfo.com websites. Following the photo gallery we have a reprint of some of the Marvel Comics adaption of Dune. However, all the text is in German again. Only portions of the original comic are reprinted. You can pick these up on ebay for around $2, so it's partial inclusion here isn't really a big deal. Following the comic is another section of the Museum Arrakeen website on failed attempts at making Dune into a film, including info on the Ridley Scott and Jodorowski versions. Also in this section are photo galleries of concept designs for the film by H.R. Giger and Christopher Foss designs, as well as Jean "Moebius" Girard's costume designs. These are certainly some of the most interesting galleries on the disc, as far as I know the Giger images are not available online anywhere, so their inclusion here is a nice bonus. This is a section worthy of a dvd special edition. Next up, the promotional items and production photo galleries are repeated from disc one, as was mentioned earlier in that section. All of the promotional items photos are taken from the duneinfo.com website. 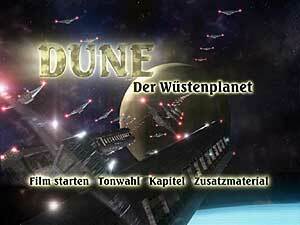 Also included on the extras disc is the trailer for the Sci-fi Channel's "Children of Dune" mini-series. The next extra consists of the entire Dune soundtrack, which plays clips from the film along with the music. 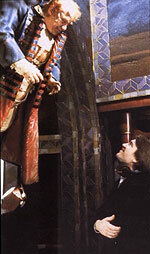 The scenes used are more or less the ones where the music is used in the film. The goal was obviously to create pseudo music videos for the music from the film, though the scenes are presented in a little box on the screen along with the track and title information, so this doesn't really work too well. Anyone up for some deleted scenes? Well, don't get too excited, despite what they advertise, there aren't any actual scenes here. Instead we have stills from deleted scenes, much in the same way the MGM Blue Velvet DVD presented them. Apparently the actual footage is long lost. This would be a really nice extra as it is on the MGM BV disc, if it weren't for the fact that the entire section, text and all, is taken directly from a page at the duneinfo.com website here. The text on the disc has been translated into German though. Next is the concept design and storyboard gallery. These images are different than the Giger and Foss ones mentioned above. Many of the images in this gallery are repeats from the previous behind the scenes gallery though. They're also taken from the duneinfo website. Next we come to what has to be the worst extra of them all: a section taken straight off the web listing the various Dune books. But when I say taken straight off the web, I mean just that. The picture at right is not a picture of the DVD taken off my screen, that is actually a direct screen capture from the dvd itself! For this section, they actually pointed a video camera at a computer monitor for the image, occasionally scrolling down so you can see the next book. I guess they never heard of screen capture software. Anyway, because of the poor quality the text is almost unreadable. You'd think people would really be embarrassed to actually put this on a commercial DVD, but apparently not. The final extra on disc three is a repeat of the goofs section from disc one, but with a few different goofs. Again, this is taken directly from the duneinfo.com website, text and all, from a page here. The text on the DVD has been translated into German though. Disc four is a cd of the music from Dune. This is the same as the regular commercial release of the Dune soundtrack, not the rare extended two disc version that was out a few years ago. Also included in the set is a numbered 16mm film cel and a 22 page booklet on the film, all in German. So, is this new Dune set really a "Perfect Collection." Well, personally I don't think so. 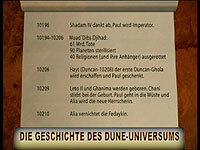 I know I have several items related to Dune that would make far better extras. Everything about this set, aside from the packaging, is amateurish. Am I being a bit too hard on this disc collection and expecting too much? Maybe, but with a price tag of almost $100 USD, a lot should be expected. Nothing new was created for this set. All the extras were taken either from websites (almost all actually) or from a few other readily available existing materials. The only thing new here is the transfer, which is finally anamorphic, but still leaves room for improvement. Basically, this set is the equivalent of if I took everything here at Lynchnet, put it on a dvd, and asked you to pay me $100 for it, yet still left all the material online for free as well. No real effort was put into creating anything special for this "Perfect Collection," and certainly nothing that justifies the hefty price tag attached. There are a few nice inclusions, such as the Micra ad and the concept design galleries, but they are too few and far between for the cost. Sure, it looks like there are a lot of extras, but it's the quality, not the quantity that counts. Most of the extras are text taken directly from websites you can read for free. When you add it all up, I really don't think the collection is worth the money. 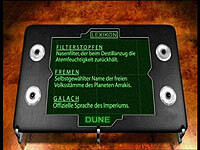 I would only recommend this dvd set to people who have no internet access, are fluent in German and are die-hard Dune or Lynch collectors with lots of money to throw around. Anyone else can probably skip it. The packaging is really nice, but the content is a let down. If this set was $30 I'd be more inclined to let the quality of the extras and transfer slide, but for $100 I can't.